The Snack World television series ran for 50 episodes from April 2017 to April 2018. 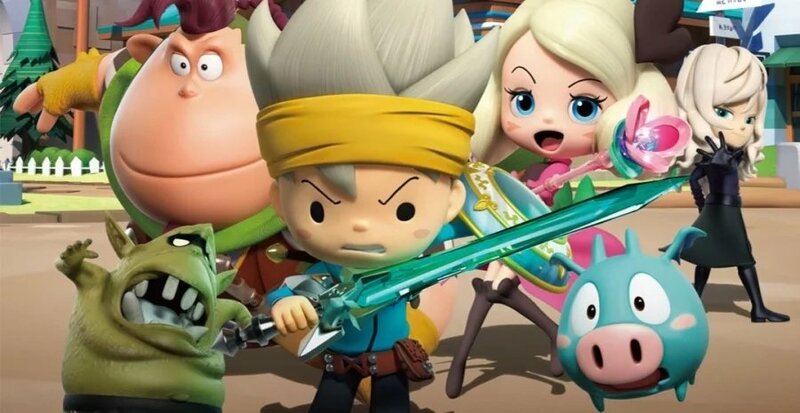 The Snack World: Trejarers video game arrived in August 2017 and an enhanced version - known as The Snack World: Trejarers Gold - was ported across to the Switch in April 2018. SNACK WORLD is a nutty place where mythology, fairy tales, and technology are fusion fare! When an evil mogul wrongs the young hero Chup, the boy and his bite-sized crew embark on an epic adventure of serving just deserts to the giant jerk. Have you been wanting to play this game? Are you excited about all of these Level-5 games being localised for the Switch? Tell us down in the comments. FINALLY!!!! As a HUGE fan of their game Fantasy Life, this game was promised to kind of be similar in a way. So I'm really excited. Cool! I'd really like to get this game. @LN3000 Hold on, really???!!! My first thought was this was going to be some stupid game I'd never care about but I LOVED Fantasy Life! I need to look at my 3ds history but I'm sure I put at least 200 hours into that game. Something like that on Switch would make me very happy! I remember being interested in this so bring it here. Been pretty interested in this one for ages. Wish Level-5's games didn't always take so long to get localised. @BenAV My thoughts. I nearly forgot about this game, it's taken ages to get localised, but if it ever comes, I'll likely get it. If it's half as good as Fantasy Life, I know I'll love it. I would love to have this game on the 3ds! Fantasy Life 2 for Switch, please. Awesome been wanting to play this so much that i have almost imported the japanese version several times. Big fan of Level 5 studios and their games. Been waiting on this one. They take forever to localize their games. I’m just glad it’s coming. I was just wondering what happened to this game. Omg yes yes yes! Fantasy Life-esque game on switch! I'm down to boogie with this. Looks delightful. Finally! I've been wanting to play this game for years now! Hopefully it is the Switch version, or both. The localization might prove to be very challenging... This show plays a lot with words and other things that only make sense in Japanese. I wonder how they plan to translate it to English without losing the spark. The show might end up losing what makes it fun in the first place. I really hope they give it the necessary care and do a good job with the localization. Yep, I'd say any baddie deserves being transported to barren deserts. Closest thing to Fantasy Life on Switch so far. I’ll happily take it. Finally!!!!!!!!!!!!!!!!!!!! The Snack World is Coming to North America Big Fan of the LEVEL-5 and Nintendo!!!!!!!!!! Thank You LEVEL-5!!!!!!!!!!!!!!!! Oooh man, I'm getting so many Fantasy Life vibes here. I love a lot of their games; I'm currently working my way through Yo-Kai Watch 3 and the old DS version of Ni No Kuni, but Fantasy Life was my absolute FAVOURITE Level-5 game. I sunk over 200hrs into it and came very near to 100%ing it. I still do multiplayer with my friend on occassion. So I'm now really, really looking forward to this!